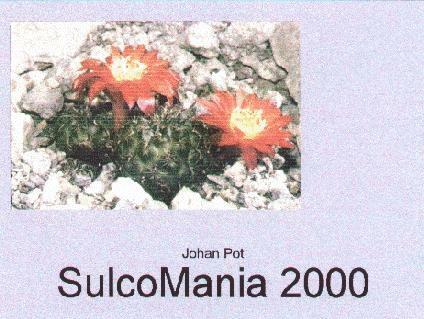 This is a CD which I am sure will be a 'must' for Sulcorebutia fans. The system software has been extensively changed since the first edition and has been obviously designed with more than just the current coverage of Sulcorebutia in mind. I found this at first not so easy to use and frequently needed to refer to the on-line help to find out how to do things. This is perhaps inevitable with what is evidently a more powerful and complex system than used previously. I also encountered a few run-time errors but these did not seem to cause any serious problems. The CD contains some 2,000 images of plants, both in cultivation and in habitat, photographs and line drawings of flowers, seeds, spines etc. I have not checked picture for picture but my general impression was that they have improved over the first edition. The CD is orgnised by both collection numbers and names allowing effective access to the extensive data by a number of methods. You can browse through the data and images, use a key or set up searches. Extensive maps, grid references and altitude records give detailed information on the distribution of the plants. The CD is produced by Johan Pot (The Netherlands) and has support for five languages built in (English, German, Dutch, French and Spanish). The system is written in Visual Basic and needs a Windows PC. The author is to be congratulated on the amount of work he has put into this project and indeed has the distinction of producing the first solely cactus CD-ROM which goes beyond simple storage of photographs and exploits the possibilities of the media. This valuable CD is available for only 50 US$ (£32 UK) including postage and packing.